Hans now has about 900hrs flying time on the 701, and I have 900 on the Savannah that we’ve used for most of the direct comparisons. Both are equipped with Rotax 912S, 100hp, and are very similar all up weights. We’re experimenters at heart, so we’ve also gone on to remove the slats from both of them, and extend the wings on the 701, so that adds to our experience with these aircraft. On the market you have a choice of the Savannah ‘VG’ model, or the standard CH701 with short wing and slats, but I’ll also include comments on our modified 701 with longer wing and VGs instead of slats, just to widen the perspective. Of course, the first criticism of this comparison from 701 enthusiasts will be that the 701 slats probably weren’t built and installed exactly as required. Well, I must point out that Hans, the builder of the 701 that we have used for most of the testing, is a dedicated and experienced craftsman, ex Royal Dutch Air Force crew chief, and he built his 701 from a kit exactly as specified. The most significant difference that you see immediately is the cutaway over the cabin of the 701, whereas the Savannah wing carries straight through. The Savannah wing is also 2.6 ft longer overall span. Profile and thickness of the wings are identical. There have been a couple of significant upgrades on spar and strut attachments – the ‘SP’ mod on the 701, and the 560kg upgrade on the Savannah. The flaperons are the same. Neither aircraft has washout in the wing, but there is an offset between the inner and outer ailerons, which is very effective to produce the same effect as washout. The slats were the same, but now I.C.P. Savannah has relaced the slats with a ‘VG’ version with leading edge extended 66mm forward, and VGs instead of slats. Another significant difference is that the 701 has 75mm dihedral, while the Savannah has none. The Savannah main wing spar to fuselage attachment is at the top of the spar, while the 701 is at the bottom, so the welded framework over the cockpit is different, and different strengthening on the inboard ends of the spars. This makes for more headroom in the Savannah, but a steeper windscreen. Other than that, the fuselages are pretty much identical. The tail of the Savannah is quite different from the 701. Most obvious is the fixed vertical stabilizer and attached rudder, while the 701 uses that distinctive all-flying rudder. The horizontal stabilizer on the Savannah is symmetrical, rather than that distinctive inverted airfoil on the 701. It’s also 230 mm more span than the 701 stab due to the moulded plastic tips. The Savannah elevator is 60 mm longer (front to trailing edge). The Savannah kit is very well detailed, and all the CNC made parts fit amazingly well. Only a few extrusions that have been drilled by hand are annoyingly half a hole off... The instructions are pathetic, and it’s not just language translation, they’re poorly compiled. Lots of rivets need to be drilled out later because the instructions didn’t warn to leave them open until fitted up to something else later.... There’s a great opportunity here for someone to make a good DVD showing the process in better detail. Despite all that, a first time builder here logged 400hrs to completion, ready to fly – but he’s a speedy worker in whatever he does. The very best aspect of the CH701 is that it can be built from plans and stock materials very economically. The simple design and construction uses these stock materials very well. The plans are pretty good, a third-party DVD give much more detail, and there’s lots of support on the web from other builders. The longer wing on the Savannah really shows up in the difference in glide ratios. 7:1 for the Savannah and 4.9:1 for the 701, both with slats. Now I.C.P. has replaced the slats with VGs and the G/R is up to 8:1 @ 45kts. At 40 kts the Savannah glides really well, while the 701 with slats is falling rapidly at +800fpm, and not much control...... Even at 35kts, engine off, the Savannah still has a good controllable glide – can’t do that at all in the original 701. The 701 with slats needs to be flown with power all the way, right to touch-down, to overcome the rapidly increasing drag from the slats as the AoA increases. That’s a handy technique to easily judge spot landings – just pull the power and it’ll sit down right now, no floating on. Just be sure you’re right close to the ground when you do pull the power..... That power is also essential to get enough elevator control to hold the high AoA necessary for the slats to be effective. The 701 works well when landed that way, and many pilots prefer to ‘fly with the throttle’. Of course the Savannah can be flown on with power as well, just needs less power due to less drag, but tends to float on farther than expected once the power is cut. I much prefer to fly a glide approach at idle power all the way from base leg, and maybe just a trickle of power late in the flare to hold off for that really slow, gentle touch-down – it’s a great feeling!!! The Savannah may look like a copy of the 701, but with the changes made they fly quite differently when it comes to both landings and cruise. The early Savannah with slats had similar drag characteristics as the 701, but much more lift due to the larger wing area, so touched down at a considerably slower speed. I haven’t measured landing distances, but do have a very good real life comparison. At our home airfield, the runway has a taxiway entrance 50 metres from the threshold. The runway is quite downhill at this point, and the surface is grass and loose dirt, so braking traction is poor. I’ve always been able to land my Savannah in this area and turn off to the taxiway. In his original 701, Hans tried and tried to be able to do that but just couldn’t, much to his annoyance....... Now that he’s extended his wings he can do it as well, and is very satisfied! 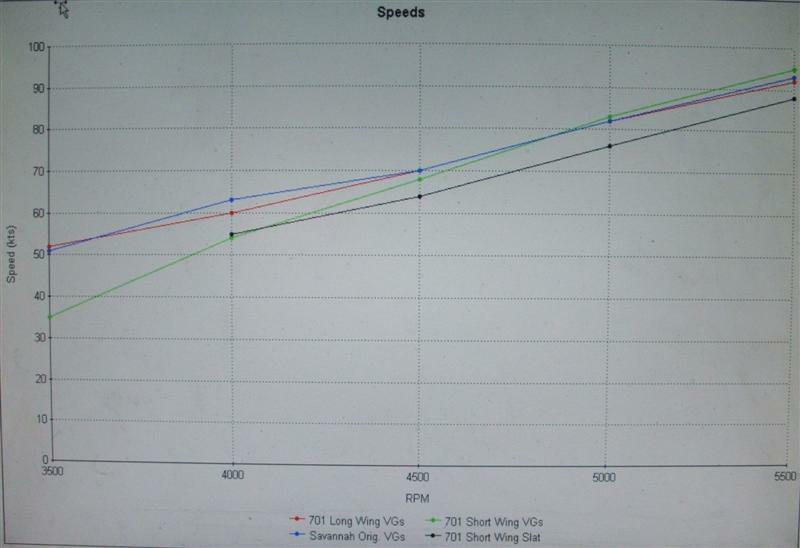 Fuel consumption is more difficult to compare accurately due to different props. At 75kts economy cruise over a 50hr cross-country trip, the original 701 with slats, used 17 litres/hr (4.5gal/hr), while the Savannah without slats used 13 litres/hr (3.4 gal/hr). That's 25% more with the slats, and makes a heck of a difference for fuel planning on long flights...... On a more recent 38 hr trip at 80kts, the 701 with long wing and VGs, and the Savannah, both used 16.4 litres/hr (4.3gal/hr). The difference in horizontal stabilizers is really interesting. That unique horizontal stabilizer with its inverted airfoil on the 701 looks great in theory, and works well enough with power on, but can’t flare to a high AoA at idle power. This is a problem that has plagued 701 flyers for a long time...... There is a fix for this lack of elevator authority on the 701 – see ‘Tail Feathers’ page. With its symmetrical horizontal stab and the larger elevator, the Savannah can pull a high AoA even in a power-off situation. Those all-flying flaperons on both aircraft are really excellent! 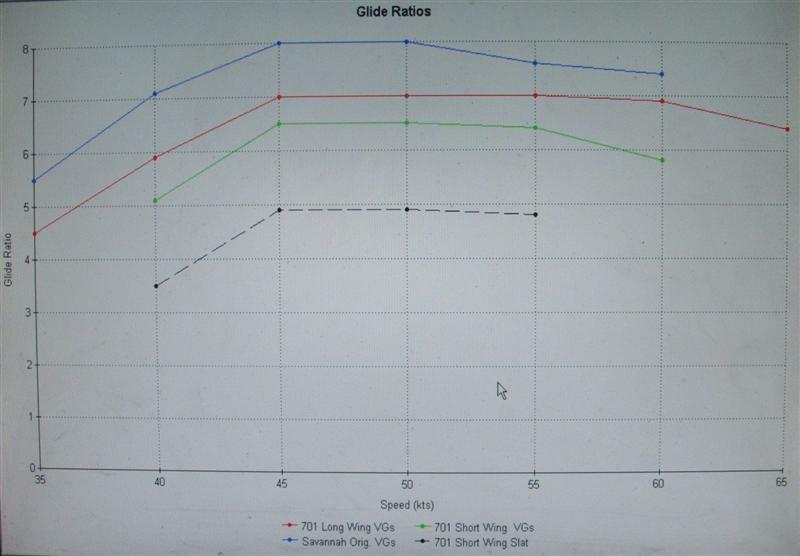 They give very positive roll control, without adverse yaw, right down to minimum flying speeds. At 15º flap extension they give more lift with very little extra drag, and really steady the aircraft at low speed. Neither aircraft tends to stall a wingtip, due to the ‘washout effect’ from those offset ailerons. They really do work well! The Savannah VG is about equal in STOL, and heck of a lot better in cruise! But with the longer wing on the 701, and VGs instead of slats, they are pretty much equal. I reckon that a good analagy with vehicles, is that the 701 is like an original Willys WW2 Jeep, while the Savannah is a more recent Suzuki 4wd. The Jeep was the inspiration, but Suzuki has considerably improved it. I've had a fair bit of experience with both vehicles, and find that the Suzuki 4wd is better off-road, and very much better on the road than the Willys. Just as the Savannah is a bit better at STOL and very much better at cruise.